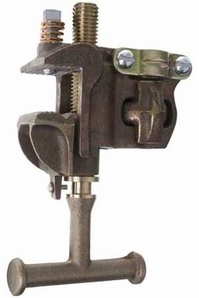 Hubble G33632 Grounding Clamp is a Tower and Flat-Face clamp with a Bronze Body, Serrated Jaws, a Bronze T-handle with fine threads and Bronze pressure-type terminal. Main Line Range - Min. 1/8"
Weight Each 2 1/2 lb./1.1 kg.